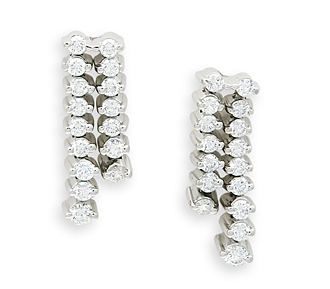 Asymmetrical strands of 2-prong set round diamonds give this pair of diamond earrings a modern flair. Because of the setting, this bridal jewelry delivers plenty of sparkle. Borrow wedding jewelry and enjoy the elegant touch of real diamonds. Diamonds: 1.50 TW | Gold: 14K White | Post | Length: 7/8 in.